You may have an outstanding product, but a dull Amazon listing might never sell it well. If you want to stand out in the eyes of your clients, you have to customize your content. Insightful pictures, the product’s what’s and why’s, as well as your brand history, they all matter towards achieving your goals. The Amazon Enhanced Brand Content feature gives you the possibility to do just that: make your product shine. That is, if you’re a professional seller and approved brand owner on the platform. In this article, we’re going to teach you all you need to know to use this magnificent tool and share some tips and tricks that’ll differentiate you from the mass. Part one: What is Amazon Enhanced Brand Content? Part two: What Are the Advantages of Amazon Enhanced Brand Content? Part three: What Are the Pitfalls of Amazon Enhanced Brand Content? Part four: How to Create Amazon Enhanced Brand Content? Part five: What Are the Requirements to Create Amazon Enhanced Brand Content? 1. What is Amazon Enhanced Brand Content? One of the main complaints sellers on Amazon have, is the scarce possibility to customize product descriptions. In an attempt to address this request, the platform created the Enhanced Brand Content (EBC), a feature commonly referred to as the A+ tool. The EBC enables brand owners to change and customize the product descriptions of their branded ASINs. Through the use of templates, you’ll be able to describe your product’s features in the most appropriate way, add enhanced images, and change the text placement according to your liking. Customizing the product page can ultimately lead to increased traffic and higher conversion rates. While this feature seems awesome, you must also know that the A+ tool is only available to professional sellers who have already been approved as brand owners or emerging brand owners who are part of specific programs, such as Amazon Exclusives or Launchpad. 2. What Are the Advantages of Amazon Enhanced Brand Content? Although some users argue the EBC function is not as flexible as custom HTML control, the truth is that it’s very intuitive, easy to use, and it truly helps you achieve the desired results. And that’s what matters at the end of the day. Break up your content in small paragraphs and make it scannable. Add subheadings, bullet points, and use custom text features such as bold, italic, and underlined text. Add enhanced images containing bits of description or headings onto them. All these features ultimately allow you to optimize your product listing into logical chunks of information instead of settling for a big lump of text no one will have the curiosity to read. Aesthetic appeal: All shoppers will like it, regardless of how they read a product description. It will make your content scannable for those who want to see quickly which are the main features and easy to read for those shoppers who like to sit and read every detail. Enhanced product pictures will also catch those shoppers who like to stare at images for ages before making a final decision. Regardless of what potential clients you have, a curated listing will make everyone stay on your product page for longer, which means better chances of conversion. Sales boost: It’s easy to understand from all the above that a nice listing means more people willing to find out what your product’s about. Enhanced brand content can convince visitors about your product’s qualities, driving up your sales. 3. What Are the Pitfalls of Amazon Enhanced Brand Content? Like with everything else, there isn’t all milk and honey when it comes to creating an enhanced brand content listing. Here are the major pitfalls that make most sellers think twice before embarking on this adventure. It’s time-consuming. EBC requires high-quality images and graphics, as well as truly engaging content. You can’t just break up the chunk of content that’s on your product’s page anyway and reuse it. You must get creative and come up with a text that stands out. And this leads us to number two. It can be expensive. Not all brand owners are wordsmiths, and if you’re not good with words, you’ll likely have to pay a competent copywriter to do the hard work for you. Getting professional product images and graphics can also be expensive. Content is manually approved. And that’s another drawback. Because even if you like what your content writer came up with, whoever approves the listing might disagree with it. There is even a chance to see your content rejected even if you used it in your original listing. The approval process is slow. So, once you’ve submitted a listing, you might have to wait for up to a week or more to see it online. EBC content is not indexed. This is the biggest bummer because any target or long-tail keywords you decide to include in your content will be pretty much useless. That’s why so many pages boasting beautiful EBC also keep the ugly lumps of text on their page. 4. How to Create Amazon Enhanced Brand Content? 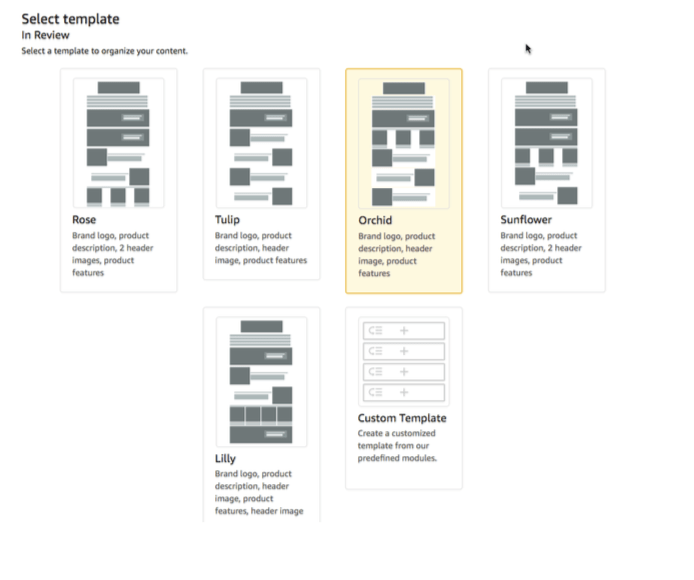 Creating enhanced brand content on Amazon is easy thanks to the built-in templates you can use. However, you must comply with a series of requirements. Before talking about them though, here’s to create your listing 101. Go to the Enhanced Brand Content tab under the Advertising section on your Seller Central page. Enter the SKU and click on Get Started. Pick your preferred content template. Add your content. Fill in the text boxes and upload your images. Take all the time you need to customize the content and images until the listing looks exactly as you want it to look. Submit for revision. And keep your fingers crossed so that it will get approved quickly. In the meantime, just sit back, relax, and wait for things to happen. If your content has been approved, all you need to do is watch how it performs. Otherwise, the Amazon team will reject your content and tell you which amendments to make to have it approved. Work your way through it and submit for approval again. 5. What Are the Requirements to Create Amazon Enhanced Brand Content? The first and foremost important thing to know before creating content and shooting professional product picture is that the A+ tool is only available to professional Brand Registered sellers. In simple words, this means that you have to register your brand in the Amazon Brand Registry, and you won’t be able to do that if you’re selling in the media, video, or digital and book categories. You can also publish EBC for all ASINs that you own as a registered brand owner, but you can’t have more than 20 pending submissions at any given time. Typically, it takes anywhere from 2 to 7 days for the content to be reviewed and either approved or rejected. Under the Enhanced Brand Content, Amazon gives you the possibility to select one of the pre-customized listing templates or create a bespoke one from scratch. We wouldn’t advise you to opt for the latter unless you’re a sales expert and know exactly how to design a product pitch. Rose: Consists of two top banners followed by an enhancing graphic. This template is great if you have a line of products and want to make a comparison between them. Tulip: Features a header image followed by a zigzag product features list and is ideal for those products that don’t require extensive descriptions. Orchid: A top banner is followed by three thumbnails and a zigzag list for the product features. This one is perfect if you want to show off your product’s unique features through images rather than text. Sunflower: This template is very similar to the Orchid but features two top banners instead of one. It works perfectly for the same type of products. Lilly: Is similar to the Rose template and it can be used in a similar fashion. This one also works well for those products that need little to no descriptions. If none of the templates above are of your liking, you can create a custom template by using five predefined modules you can mix, match, and arrange in any way you like. As long as you have the prerequisites to adhere to Amazon Enhanced Brand Content and are aware of this tool’s advantages and limitations, the A+ tool gives you a real opportunity to boost your sales. So, arm yourself with patience and start transforming your dull product listings into truly converting ones.